Palletizing has gone a whole notch today, all thanks to robotic arms. In majority of the fast-faced manufacturing industries, the first priority is efficiency. Nothing put a company on a competitive edge that the quality of its products and the speed of production. That is exactly what robot palletizing does. 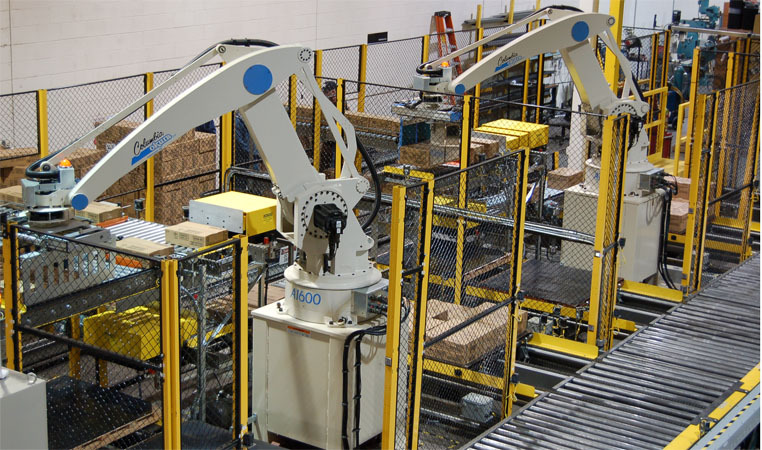 One of the major manufacturers of robotic arms, Universal Robots is in the forefront of making sure that many industries from all over the world attain this efficiency with their line of UR palletizing robots. As good as the palletizing robots are, there is however, concern on whether they are better than the traditional conventional palletizing methods. It is important to note that both the robotic and conventional palletizers carry out the same kind of work. They both accept luggage, parcels, or bags and arrange them in layers before palletizing them. Both the conventional and robotic palletizers use PLCs with touch screen operator interfaces to control them. The major difference is their mechanisms. Below is a look at the comparisons between the two and what benefits they bring to the table. Programming of the two is similar. Both are programmed by an operator interface touchscreen to handle different tasks of loading products. This is from the stacking patterns to the sizes and weights of the products. The difference between the two when it comes to versatility is that robotic palletizers do not need many mechanical adjustments to handle the products. In majority of the cases, the robots do not actually need any extra mechanical adjustments. Conventional palletizers on the other hand need adjustment to handle different product sizes and weight. Both the conventional and robotic palletizers need capital to set up. However, when it comes to the operating costs, robotic palletizers require much less, than the conventional palletizers do. The main reason is servomotors power robotics, which consumes less energy while conventional palletizers use gear motors that consume a lot of energy. When it comes to space, a conventional palletizer has slight advantage over the robotic palletizer because it requires less space. Robotic needs more space because of the arms. A robotic palletizer is faster than a conventional palletizer is and can stack up more products in a day than the latter would. This helps to increase production and raise the company’s ROI. For the two to keep working well all year round, they need regular maintenance. Of the two, the conventional palletizer has more parts than the robotic. This means that the conventional palletizer needs more maintenance than the robotic. More routine maintenance checks are carried out on the conventional palletizer than on the robotic. If however a part of the robotic fails to work, it may cost more money to repair than that of a conventional palletizer. One of the things that make conventional palletizers stand out is the quality of the packaged pallets. Unlike robotics, conventional palletizers produce stable or more even pallets. This is because after layering of the pallets, they are compressed together to give an even look. A robotic can pick up packages from any position even those strewn on the floor that the conventional palletizer cannot do. This enables the company to get rid of unnecessary equipment like conveyor belts. The arms can stack up products in every corner of the industry. They can penetrate places that the conventional palletizer cannot. The choice you make for what to use for your palletizing will mainly depend on the production rate you want to take and the kind of warehouse you have. If you have stacks that need high-rise packing, then you will definitely opt to go with the robotics. If you decide to go with the robotic arms, you will find the best selection of collaborative robots with flexible and safety features from Universal Robots. Do HGH Make Users Tall After Adolescents?